UPDATED: Sun., Aug. 26, 2018, 7:02 p.m.
PHOENIX – Perhaps it was only a matter of time before he produced an eruption of power. For the first two games of the series, the Mariners had managed to keep the powerful bat of Paul Goldschmidt reasonably quiet. 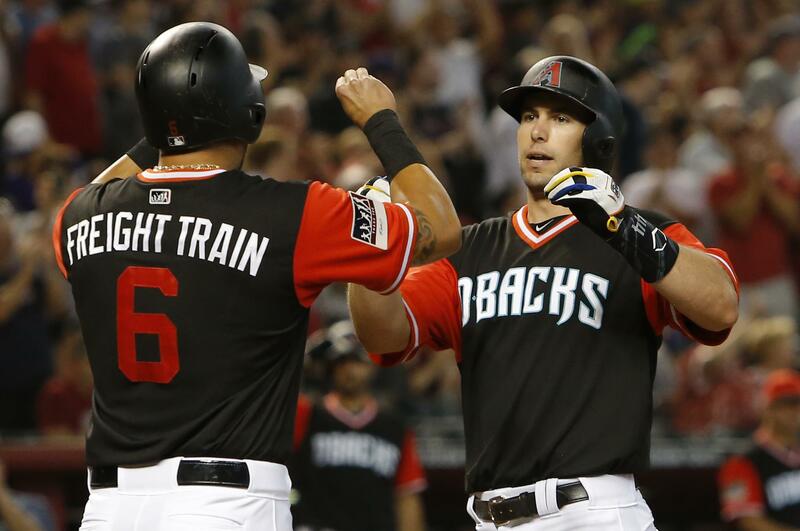 One of the most feared hitters in baseball and a perennial National League MVP candidate, Goldschmidt had just one single with four strikeouts in nine combined plate appearances in the Mariners’ first two wins of the series. But on Sunday, Goldschmidt served up a reminder of how fortunate and effective Seattle pitchers had been in the previous two games. With two outs in the third inning and Seattle starter Mike Leake trying to wiggle out of a predicament that already resulted in two runs for Arizona, Goldschmidt unleashed a vicious swing on a misplaced 0-1 sinker. It produced a prodigious blast into deep left field that smacked off the facade of the upper deck for a three-run homer. What might have been a workable one-run deficit against Arizona ace Zack Greinke ballooned into something the Mariners couldn’t rally from, resulting in an eventual 5-2 loss. Seattle had to settle for a series win over Arizona instead of a sweep. A winning series is always the goal, but with Oakland winning in Minneapolis on Sunday, the Mariners fell another game back in the race for the second wild card. Seattle now trails by five games as it goes into an off-day on Monday before a two-game series with the Padres. The Mariners made it interesting in the ninth. Trailing 5-1, Ben Gamel and Chris Herrmann started off the inning with singles off Arizona reliever Brad Boxberger. A dropped fly ball by David Peralta in left field off the bat of Dee Gordon led to a run. Pinch hitter Nelson Cruz worked a walk to load the bases with no outs to bring the tying run to the plate twice. But Mitch Haniger’s 105 mph line drive rocketed right into the glove of third baseman Eduardo Escobar for the first out of the inning. Robinson Cano then grounded into a game-ending double play. The infield hit that Servais mentioned was a bit of misfortune for the Mariners that allowed Goldschmidt to get to the plate in that third inning. After giving three straight one-out singles, Leake allowed a run on a deep sacrifice fly to center that tied the game at 1-1. He appeared to have the third out of the inning when Peralta hit a soft ground ball to the right side of the infield. The Mariners were in a shift with second baseman Dee Gordon playing on the outfield grass. Shortstop Jean Segura tried to make a play on it but couldn’t field it cleanly to even get a throw off. Another run scored on the play, giving the Diamondbacks a 2-1 lead and allowing Goldschmidt to come to the plate in a situation to do damage. “It’s tough when you are giving them extra outs,” Leake said. Extra outs led to extra runs allowed with Goldschmidt’s 30th homer of the season. Leake had to be scratched from his previous start due to an illness but said he felt no issues during his outing. He pitched six innings, allowing the five runs on seven hits with no walks and six strikeouts. He allowed just one hit after the third. The Mariners scratched out a run in the first inning against Greinke. Haniger reached on a throwing error by Ketel Marte, advanced to third on Denard Span’s two-out single to left and trotted home on Kyle Seager’s line-drive single to right. Seattle again struggled with runners in scoring position, going 1 for 10 while stranding nine runners on base. Greinke pitched 6 2/3 innings, allowing just the one unearned run on five hits with two walks and six strikeouts to improve to 13-8. Published: Aug. 26, 2018, 4:59 p.m. Updated: Aug. 26, 2018, 7:02 p.m.